On Saturday, Steve and I decided that we needed a break from the soccer field, so we ran away into the city with the kids. First, we went to check out some exhibits at MOMA (pictures later). 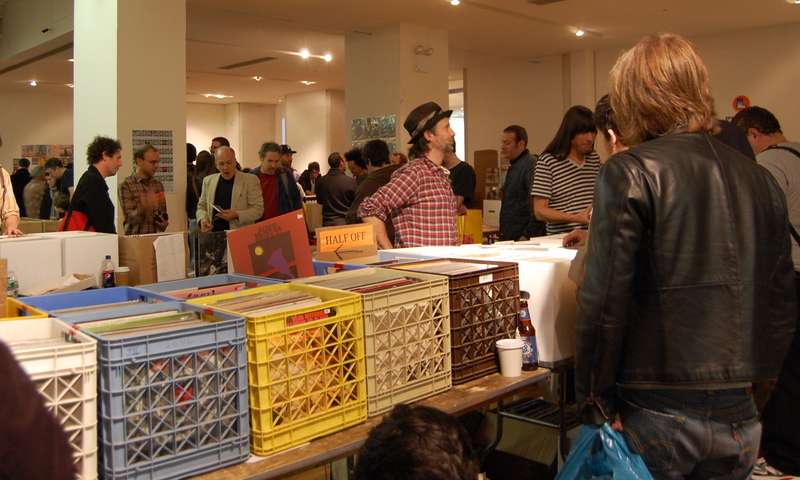 Instead of horsing around at playgrounds of Central Park afterwards, Steve decided to take us downtown to see a record fair, which was run by the local alt-rock radio station. The boys got a subway ride out of the deal, which is always a cheap thrill. 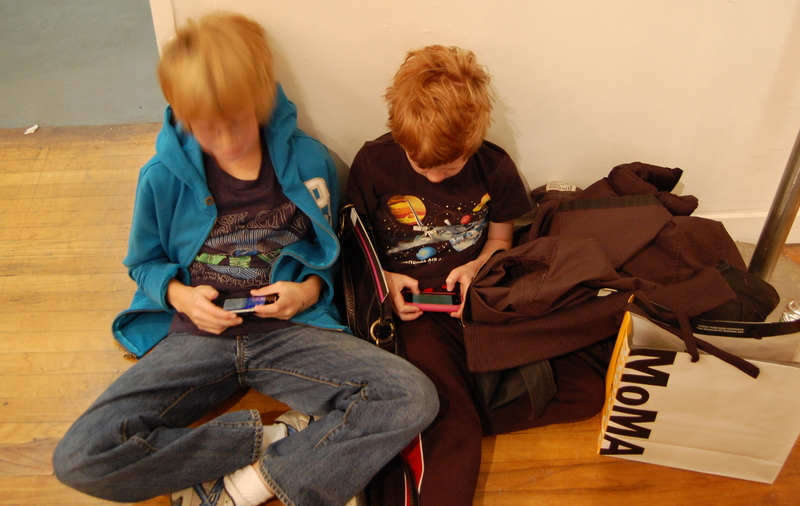 When we got there, I set them up with iPhones in the corner. 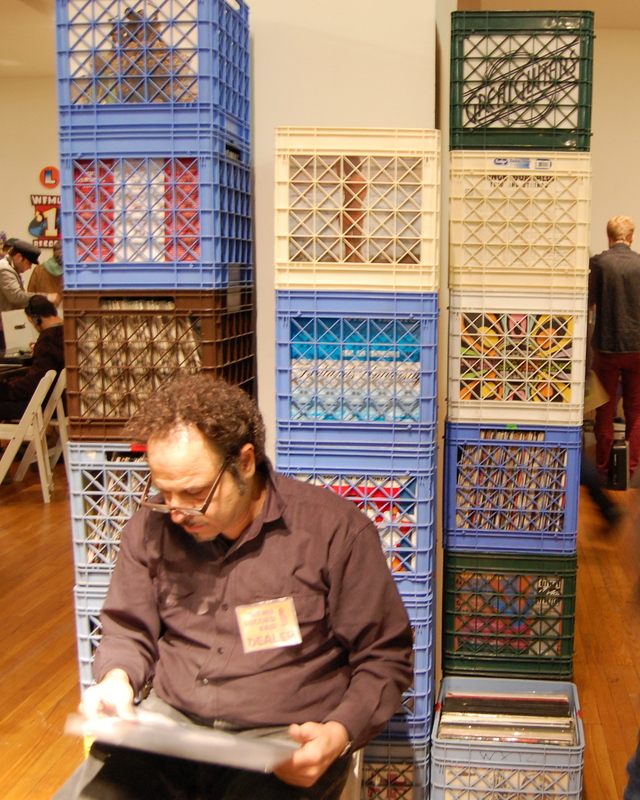 Steve joined the other geeks and shuffled through old albums in milk cartons. I took pictures of the geeks. 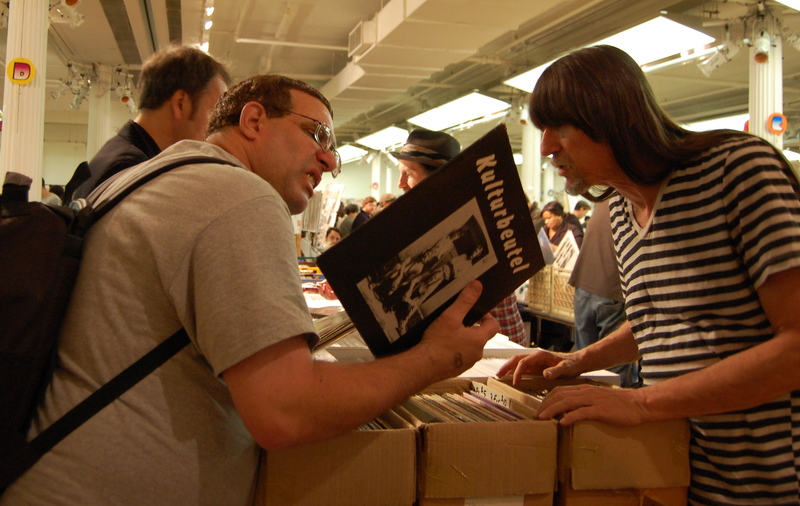 I have a weakness for subcultures and there was plenty of awesome subculture action at this Record Fair. It was almost all guys with a few gender-ambiguous types thrown in. 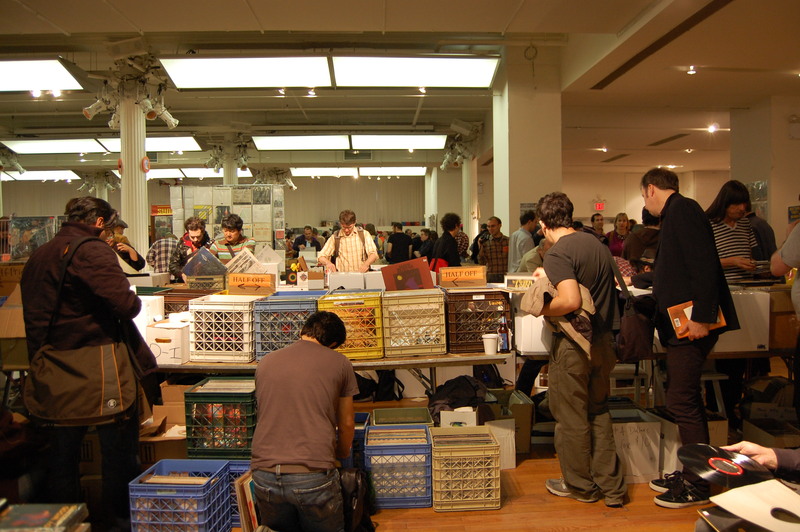 I remember sifting through racks of albums at Bleeker Bobs back in the 80s. These guys never left the 80s. I've heard that albums are making a come back. People are nostalgic for the old pops and crackles of the old albums. 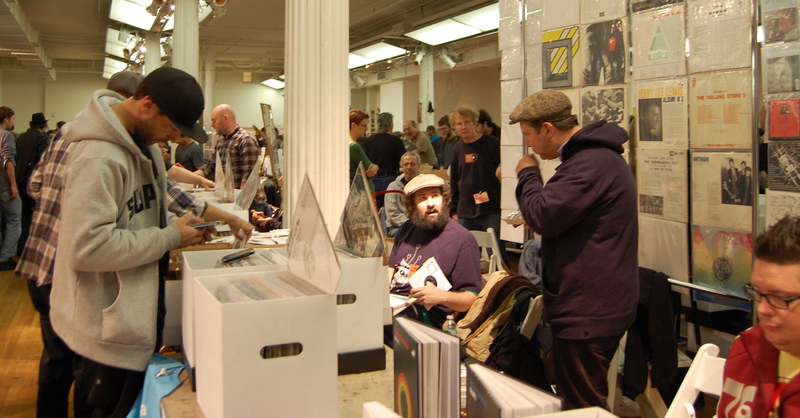 The Record Fair was super crowded. It's nice that there are places for people like this — people who have strong opinions about Kulturbeutel albums. He's so happy with his new purchases. Steve could have spent a long time at this place, but the kids were tired and I had enough pictures. People complain that New York City has become too bland in its tastes. They say it has lost its old grit and quirkiness. For the most part, they are right, but there are still corners of the city where geeks can come out to play. 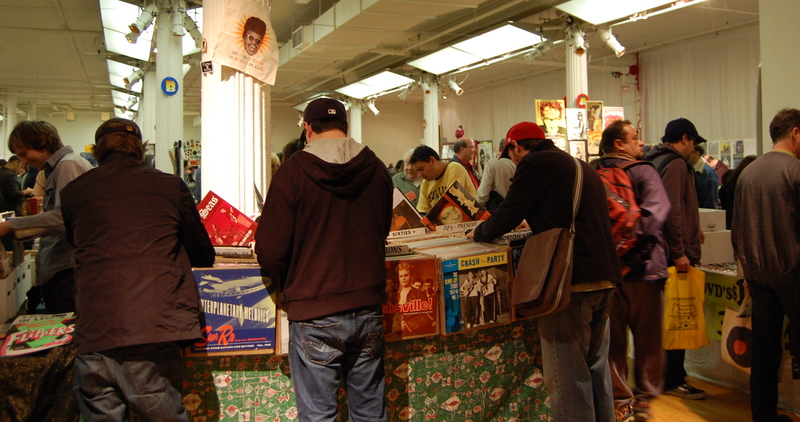 It’s not that we miss the crackle and pop, it’s that vinyl sounds better to us. Neil Young said of digital music something to the effect of – it’s like the difference between standing under a waterfall and standing under a shower of ice cubes. I can’t source that quote, here’s another: “Young said that MP3 was convenient – but that it’s like a vision of paradise that’s only inches deep and slams you in the face when you try to walk into it”. I am familiar with this discussion and it’s progression with respect to digital images (versus film) and I am unsympathetic to “holistic” explanations of why digital isn’t as good as analog. If someone’s going to make that argument, I want to here the perceptual element that they’re relying on (and know that it’s within the limits of human perception). With photography and film, people talk about the process itself sometimes (they like printing photographs from film, rather than working at a computer). That’s a perceptually identifiable difference (for example, computers smell different than darkrooms). But, “waterfalls”, softness? the certain je ne se quoi, I don’t believe it. But, I’m not opposing the geekery. I just need people to justify it on perceptual rather than theoretical or spirtual grounds. I always like geekery (i.e. passionate and learned interest in a topic). In fact, I’m demanding more geekery. I was 9 months pregnant when we moved from Brooklyn to Long Island 11+ years ago. And then I got put on bedrest, so it was better to just send me to my mom’s house to rest, thus leaving my husband to do all the moving.